Detail commonly includes: Back roads, dirt roads and trails, elevation contours, remote lakes and streams, boat ramps, public lands for recreation, land use / land cover forests, wetlands, agriculture, trailheads, campgrounds, prime hunting and fishing spots. Rand McNally's folded map for North Carolina is a must-have for anyone traveling in or through the state, offering unbeatable accuracy and reliability at a great price. Our trusted cartography shows all Interstate, U.S., state, and county highways and much more. The Blue Ridge Parkway is a winding route that traverses some of America's most picturesque scenery. The Parkway is America's most visited National Park unit and when combined with Skyline Drive through Shenandoah National Park, also covered in detail on this map, a travel experience of over almost 600 miles is created. The Blue Ridge Parkway starts in the south at the foot of the Great Smoky Mountains and runs along the Blue Ridge through several National Forests from North Carolina and into Virginia. National Geographic's Blue Ridge Parkway Destination Map strikes the perfect balance between map and guidebook and is ideal for a wide range of travelers. Destination Maps combine finely detailed maps with fascinating and practical travel information. The front side features a large-scale map of the Blue Ridge Parkway in North Carolina and Virginia and Skyline Drive in Virginia, richly layered with travel information and beautiful photographs showcasing some of many ways travelers can experience the road known as "America's Favorite Drive". In addition to the easy-to-read map on the front, the reverse side includes regional descriptions, arts and culture finds, and visitor resources. Explore detailed insets of the Great Smoky and Shenandoah National Parks. This waterproof map of North Carolina State is tear-resistant and 100% recyclable. 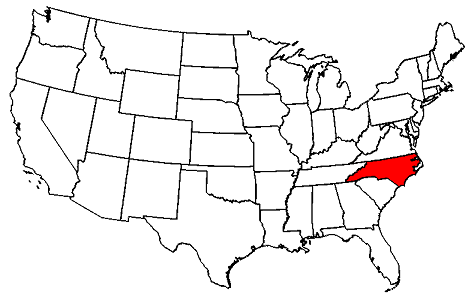 Includes coverage of: Asheville, Chapel Hill, Charlotte, Durham, Fayetteville, Great Smoky Mountains Nat l Park, Greensboro, High Point, Raleigh, Wilmington & Winston-Salem; and features: Airports, Campgrounds, Interstate Exit Numbers, Mileage Chart, North Carolina Facts, Parks & Rec Areas, Places of Interest, Scenic Routes & Ski Areas. In this third edition of his classic photography/ hiking guide, Adams showcases his own beautiful color photographs. This complete compendium lists 1,000 waterfalls, and Adams specifically highlights more than 300 of the best waterfalls found in North Carolina with full descriptions, comprehensive directions, and four-color photographs. Since the first edition of Kevin Adams’s North Carolina Waterfalls in 1994, this book has sold almost 65,000 copies. In that time, Adams has established a widespread and well-respected reputation as a photographer, naturalist, writer, and teacher. From its comprehensive coverage and detailed trail directions, to its helpful photography tips and beauty ratings, the new North Carolina Waterfalls remains the definitive guide to its subject. In addition to North Carolina Waterfalls, Kevin Adams is the author of seven additional books and their numerous revisions. He has taught nature photography seminars since the early 1990s and leads popular tours in the N.C. mountains to photograph waterfalls. He is the man behind Digital After Dark blog and the free Night Photography News e-newsletter. He lives in the mountains of North Carolina. The durable and convenient North Carolina EasyToFold state map will take all the wear and tear your journey can dish out. The heavy-duty laminated design allows you to mark your route, make notes, then wipe the surface clean for further use. This is a must-have for navigation whether you're a state resident or just passing through. National Geographic's North Carolina Guide Map is designed to meet the needs of travelers with detailed and accurate cartography and loads of helpful information about the state's many attractions. Hundreds of points of interest are shown, along with national and state parks, public campsites, visitor information centers, airports, ski areas, hospitals, and more. Cities and towns are clearly indicated and easy to find in the user-friendly index. Highways, roadways, toll roads, scenic routes, and other roads, as well as ferry routes are clearly designated. Distances in miles are noted on major highways so travelers can easily plan their best route. A chart of park service sites and climate information will be particularly helpful to travelers taking in the many outdoor activities in North Carolina. 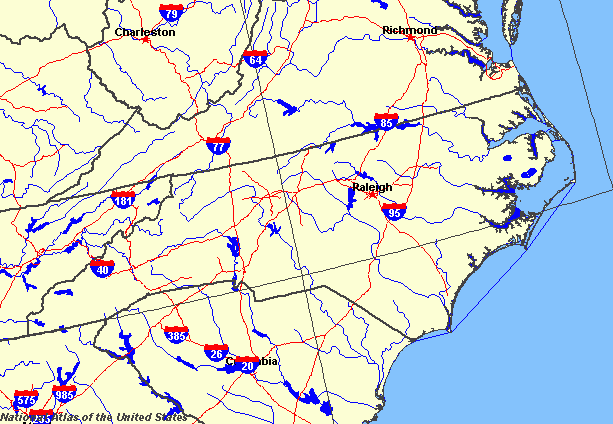 Inset maps of Raleigh-Durham, Asheville, Charlotte, Winston-Salem-Greensboro, Fayetteville, Wilmington, and Western North Carolina provide greater detail of key areas of the state. Maps and information about Blue Ridge Parkway and Great Smoky Mountains National Park highlight some of the extraordinary beauty to be found in the state. Have you ever been to the mountains of western North Carolina and wanted to see the scenery, but escape the crowds? Maybe you were tempted to take off down a side road, but hesitated, fearful of getting lost. Now, Touring the Western North Carolina Backroads can help you make that escape. The book’s 21 tours cover the entire mountain region of western North Carolina and provide numerous opportunities for seeing unspoiled landscapes and pastoral scenes. But scenery is not the only focus. Once you’re on the backroads, you might speculate about the history behind the old white clapboard farmhouse that dominates the valley ahead, or you might wonder about the rest of the story behind the two sentences on the historical marker at the side of the road. Touring the Western North Carolina Backroads fills in those details. Drawing from local histories and early travel writings, each tour is designed to be a journey through the history of the area. Tales of eccentric characters, folklore that has been passed down through the ages, and stories about early settlers combine to present a perspective that makes the scenery come alive. This third edition features updated directions, additional sites, new photographs, and nearby recreational opportunities. Use this guidebook to plan your next day trip, weekend getaway, or cycling adventure! John F. Blair’s Touring the Backroads™ series includes travel books that literally take readers off the beaten path to historic sites and landmarks. Each book departs the highways and thoroughfares in favor of the backroads, giving directions, suggested routes, and historical details along the way. These books can be read at home, or they make excellent travel companions for those looking for something beyond the norm. Carolyn Sakowski is a native of Morganton, North Carolina. She holds a B.A. in history from Queens University of Charlotte and an M.A. in history from Appalachian State University. She lives in Winston- Salem, North Carolina. Her previous books include Touring the East Tennessee Backroads and Travel North Carolina.